I arrive at the farm at 6.30am, have a shower and change into clean farm clothes and wellies. This is to ensure high biosecurity on the farm, making sure we do not bring in any germs that may be harmful to the turkeys. What is your first job in the morning? My first job every morning is to check that the birds all look healthy, that the lighting and temperature settings are all correct in the sheds, and that the litter on the floor is in good condition. I help look after five sheds, so around 30,000 turkeys. What other jobs do you have to complete in the day? Other important jobs in the day include checking that the turkey feeders are filling up and that the water gauges are lowering, so that I know the turkeys are able to access and are enjoying their food and water. If new litter (wood shavings) need to be laid, this also needs to be completed, as it is essential the floor stays as dry and fresh as possible. The porch areas of the turkeys sheds, where the control settings and wellies are kept, also need to be cleaned out and wellies washed. The people I work with. They are all great fun, hard-working and helpful – everyone mucks in! When you are learning a role it is really important that you have supportive people around you. It is also really nice to have a role where you care for animals – turkeys are quirky animals and love people so they are always pleased to see you! What skills do you need to do your role? You need to be practical, have good common sense, compassionate, have pride in what you do and a good memory helps! I left school having completed my GCSEs, and have attended an agricultural course at my local agricultural college, Easton & Otley College in Norfolk. Job roles have included working on a farm helping to look after chickens, and also with the growing, picking and selling of vegetables for the farm shop, and I have worked at a sawmill. My Dad has worked for the business for over 25 years and has always enjoyed it. The business is very supportive of me as a person and in helping building my experience as a Farm Hand. 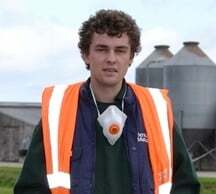 I am on an apprenticeship currently which means the business pays for me to attend a Poultec course at Mattishall, Norfolk, once a month, which means I will gain a Diploma in Livestock when completed. This covers subjects such as biosecurity and bird health. As the biggest turkey farmer in the UK, I feel I am working for the best and am very proud to be part of the team.